The Rumpler C.V was the fifth derivative of the famous World War I German two seaters. Used for reconnaissance and light bombing. 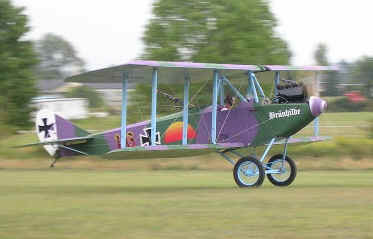 Using a large number of Dehaviland Tiger Moth parts this replica was built by Slingsby Aircraft of London, England. It is the first of two Rumpler replicas built for Universal Pictures to be used in the 1960s motion picture "Lawrence of Arabia".